The Transylvanian Hound is an ancient Hungarian breed. It was the favorite hunting dog of the aristocracy during the Middle Ages. As a result of the varying terrains, two varieties of the breed eventually developed, one with long legs and one with shorter legs. At the beginning of the 20th Century, the breed was nearly extinct. The breed was revived beginning in 1968. The short legged variety of the breed disappeared, but there are a significant number of the long legged dogs now in Hungary and Romania. The Transylvanian Hound was recognized by the United Kennel Club in 2006. Medium sized, athletically built, neither coarse nor fine. Good natured and courageous, with a quiet but determined character. The head is long, but not pointed. The skin on the head is close fitting and free of wrinkles. The skull is slightly domed. The occiput is not pronounced. The stop is slight. The muzzle is the same length as the skull. It has a straight nasal bridge, and dry, tight fitting, black lips. The Transylvanian Hound has a complete set of evenly spaced, white teeth meeting in a scissors bite. Disqualifications: Any deviation from a scissors bite. The nose is wide and black. The medium sized, almond shaped eyes are set slightly obliquely. They are dark brown in color, and have close fitting lids. The ears are set medium high and hang close to the cheeks without being folded. They widen from the base and then taper to rounded tips. When pulled forward they should just cover the eye. Disqualifications: Prick, semi-prick, or rose ears. Medium length and very muscular. There are slight folds of skin under the throat. A small dewlap is acceptable. The shoulder blades are long, and moderately sloping. The legs are straight and parallel, and set fairly well apart. The elbows are close to the chest. The body is slightly longer than tall in proportion. The chest is broad, long and not too deep. The point of the sternum does not protrude. The withers are pronounced and the topline is straight. The croup is slightly sloping and there is slight tuck-up. The legs are long and well muscled. The hocks are low set. Large and well knit, with cushioned pads. The tail is set on at medium height, and reaches slightly beyond the hocks. It is carried curved, but not curled over the back. The coat is short, straight, dense and flat. It is coarse to the touch and shiny and may have ridges or cowlicks. There is an undercoat. Serious Faults: Wiry, soft, wavy or sparse coat. 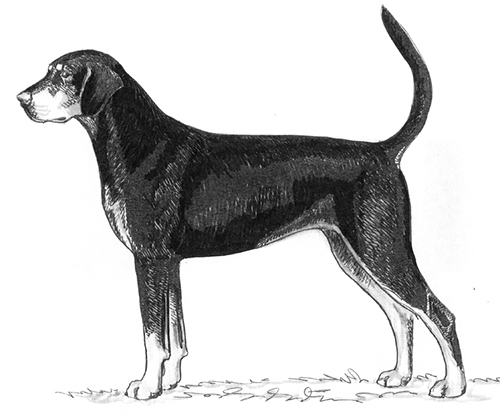 Tri-color, with a black base color, tan on the muzzle, legs and eyebrows, and white markings on the head, neck, chest, lower legs and tip of tail. Excessive white is undesirable. Disqualifications: Brown or blue base color. Height at the withers is 21.5 to 25.5 inches. Minimum weight is 55 pounds. Long and ground covering, never mincing. Any deviation from a scissors bite. Prick, semi-prick, or rose ears. Brown or blue base color.